Been slack with the posts lately because I have been doing some serious zombie research. And you know what serious zombie research means. Movies! Yes a bit of a time wrap watching (for the first time) some of the classics. Night of the living dead 1968 - The one that started it all and pretty impressive for a low budget movie. Even features a helicopter. Key lesson, zombies are the least of your worries when you are trapped in a farmhouse with strangers. Dawn of the dead 1978 - A pretty awesome action film. Even features a helicopter. Dated now but I do really love that 70s style. Day of the dead 1985 - The first thing to spring to mind during the opening sequence was Gorillaz's track M1 A1 which samples the 'Hello, Anyone out there?' dialogue. Loved the various zombie characters at the end, a clown, a cheerleader, a football player. Loved Bud. Does Romero have a thing for helicopters? Return of the living dead 1985 - Liked how the half dog and butterflies came back to life. 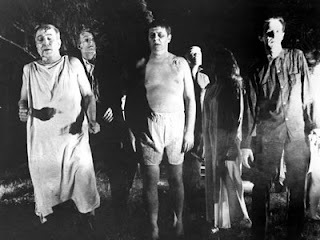 But best of all was Tarman, who has that uncoordinated zombie shuffle down pat. Mr Vampire 1985 - Miss ACE's favourite and one I have seen before. Unfortunately the version I had didn't have English subtitles but luckily slap stick comedy and awesome kung fu fights need no translation. 28 days later 2002 - Boy can Selena weld a machete or what? Featuring the infected living and a virus that can turn someone into a zombie within a few minutes. Another movie where the zombies are the least of your problems. Shaun of the dead 2004 - Nothing like a bit British comedy, particularly liked the use of a cricket bat. Bite off more popcorn than you can chew.